The incredible Wes Montgomery of 1960 was more discernible and distinctive than the guitarist who would emerge a few years later as a pop stylist and precursor to George Benson in the '70s. On this landmark recording, Montgomery veered away from his home Indianapolis-based organ combo with Melvin Rhyne, the California-based Montgomery Brothers band, and other studio sidemen he had been placed with briefly. Off to New York City and a date with Tommy Flanagan's trio, Montgomery seems in his post- to hard bop element, swinging fluently with purpose, drive, and vigor not heard in an electric guitarist since bop progenitor Charlie Christian. 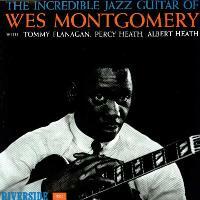 Setting him apart from the rest, this recording established Montgomery as the most formidable modern guitarist of the era, and eventually its most influential... Montgomery is clearly talented beyond convention, consistently brilliant, and indeed incredible in the company of his sidemen, and this recording -- an essential addition to every jazz guitarist fan's collection -- put him on the map. Recorded January 26 and 28, 1960. Originally released by Riverside (RLP-9320). Stereo. Limited SHM-SACD edition based on 2003 DSD masters created by Concord Music Group (US).